If you have a digital camera that is not functioning properly there is no need to toss it out. Spencer's Camera is a repair facility and can correct the problem and perform the IR modification at the same time. Most repairs will be performed at the cost of the parts alone if we are performing an IR conversion at the same time. Your camera is safe with Spencer's Camera! During the disassembly, reassembly and calibration processes Spencer's Camera's highly trained technicians use static free work areas and high quality tools specific to the electronics and camera repair industry. Manufacturer approved testing and calibration equipment is used to insure high quality performance. 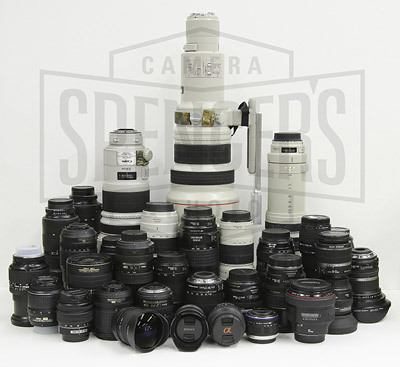 Spencer's Camera has over a hundred in-house lenses used to test all camera makes and models after the conversion has been performed. Some of our competitors use lenses and adaptors to "Ball park" the focus adjustment process, causing a wide range of focus and performance issues. Order an Infrared Conversion Here. Some of our in-house lenses used to perform focus calibrations and testing.